Pseudoexfoliation (PXF) glaucoma is a relatively common form of open-angle glaucoma that can cause significantly high eye pressures. 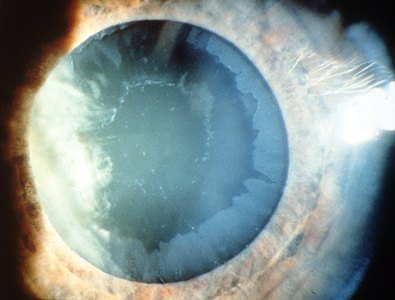 This condition is marked by a dust-like material that is observed inside the eye on the surface of the iris and lens. This ‘fibrillar’ material also gets deposited within the inner workings of the eye’s drainage system, the trabecular meshwork, increasing intraocular pressure (IOP). There is also growing evidence that this disease of the basement membrane effects other organs within the body. Pseudoexfoliation can occur in one or both eyes although it has a tendency to be quite asymmetrical and is most commonly seen in patients over the age of 70. Pseudoexfoliation Glaucoma is found in all ethnic groups, although it was once felt to be a condition exclusive to those of Scandinavian ancestry. This condition is sometimes referred to as Exfoliative Glaucoma. However, Exfoliation of the lens capsule is a completely different condition in which the outer membrane covering the lens of the eye is peeling off, or exfoliating. This is caused by exposure to Infra Red radiation and has been seen in Glassblowers. In Pseudoexfoliation, the lens capsule looks as if it is peeling but it is actually a deposit of material so it is ‘pseudo’ exfoliating. PXF Glaucoma has a wide spectrum of clinical presentations. This ranges from just incidental finding of the PXF material on the lens surface in the eye with normal eye pressures to presenting with very high pressures, often well above 40 mmHg. Unlike acute angle closure glaucoma, in which the pressure suddenly jumps above 40 mmHg, there is often no pain associated with the extremely high pressures of PXF glaucoma as the rise in pressure tends to be more gradual allowing the eye to get used to it. Treatment is often required for pseudoexfoliation glaucoma, consisting of medication, laser treatment (eg SLT), or surgery. Pseudoexfoliation can cause increased complications with cataract surgery as the ‘zonules’ that hold the crystalline lens in place are often weakened. There is some evidence to suggest that this is due to chronic inflammation directed toward these fibres within the eye. With proper treatment and monitoring, patients with pseudoexfoliation glaucoma tend to do well although constant vigilance is required to watch for the precipitous phase.